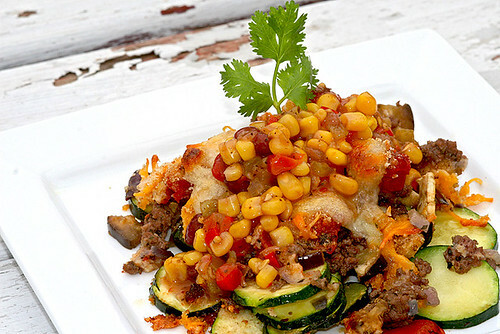 Clean out the pantry and icebox casserole. Everything but the kitchen sink casserole. Yep, you get the idea. And all of us have done it, one way or the other. It’s the end of the week and time to do another round of groceries. But you don’t want that last piece of zucchini, that last piece of cheese, whatever, to go to waste. Right? Right? Let’s see what I had left… Zucchini, roasted eggplant pieces, a can of tomatoes, an almost empty bag of cheddar, a small piece of fresh mozzarella, leftover burger patty and the remaining sweet corn salsa. Whatcha got left in your fridge? Here’s another one of my “leftover” recipes that turned out to be excellent. Big flavor, health conscious, and looks good too! What more can you ask for? The highlight of this dish comes from the spices. A combination of pure (unrefined) sesame seed oil and Chinese Five Spice powder blend which is a mixture of cinnamon, fennel seeds, cloves, star anise and ginger, or sometimes Szechuan peppercorns. It’s simple yet profound. You just have to try it to know what I’m talking about. By the way, there is an art to making fried rice. You can do it however you want ingredient and flavor-wise, but it’s first and foremost about the foundation. The texture is equally as important as the flavor. In a nutshell, you either do it right or you don’t… and it may take some time to master it. Before you cook the rice, you need to rinse the grains a few times to get rid of the starch. This helps to keep the rice from being “sticky” when it’s cooked. Then you cook it al dente with just a tad less water than as directed. When it’s done, do not open the lid. In fact, never open the lid throughout the cooking process. Keep it closed until the rice cools off, which could take hours. Then, store it in the fridge until you’re ready to make your fried rice. It’s important to note that the grains need to be cold and as dry as possible when you’re frying or you’ll end up with a sticky mess. Directions: Marinate scallops in a mixture of soy sauce, five spice powder, minced garlic and a small amount of sesame oil for at least two hours in the fridge (overnight is great). Place on a non-stick baking sheet and in a 400F preheated oven for about 20 minutes or so. Be careful not to overcook. Meanwhile, scramble the eggs, breaking it into small pieces. Set aside. Now, coat a wok or a large pan with a couple tablespoons of canola oil. In medium heat, saute garlic for a couple of minutes. Take the rice out of the fridge and break the lumps with your hand. Pour into the pan and stir vigorously until the garlic is evenly incorporated. Add the scrambled eggs, a dash of five-spice powder, salt and pepper to taste and continue to stir for another 10 minutes or so, making sure there are no lumps left. Then at the end, add a drizzle of sesame oil and some chopped scallions or chives. Turn off the heat and stir one last time until everything is evenly incorporated. 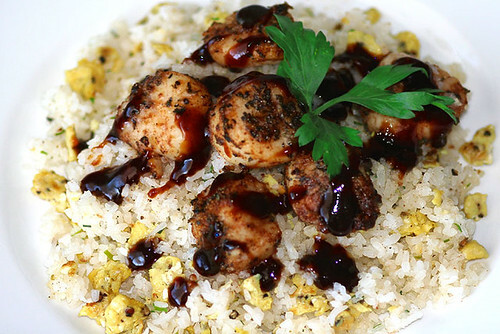 Serve rice and scallops on a plate with a dipping sauce of your choice.